Nope. Wrong decade (both versions). This film won four Oscars, though none for acting (despite a slew of nominations). I must say, it looks crisp for a film of its vintage. Last edited by obscurelabel; 01-18-11 at 09:31 AM. Death Ship? Only because that looks like Sally Ann Howes in the second pic? 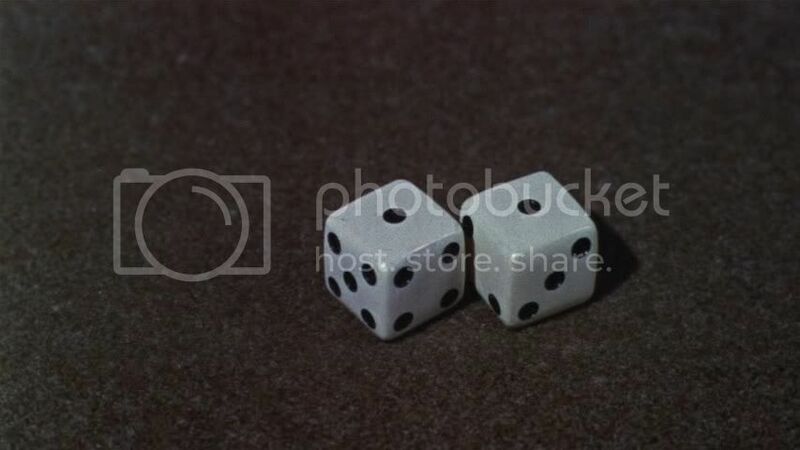 This is probably the most visually interesting shot in the whole mediocre (at best) movie. Last edited by obscurelabel; 01-18-11 at 10:34 PM. This must be from the '50s, or '60s at the latest. 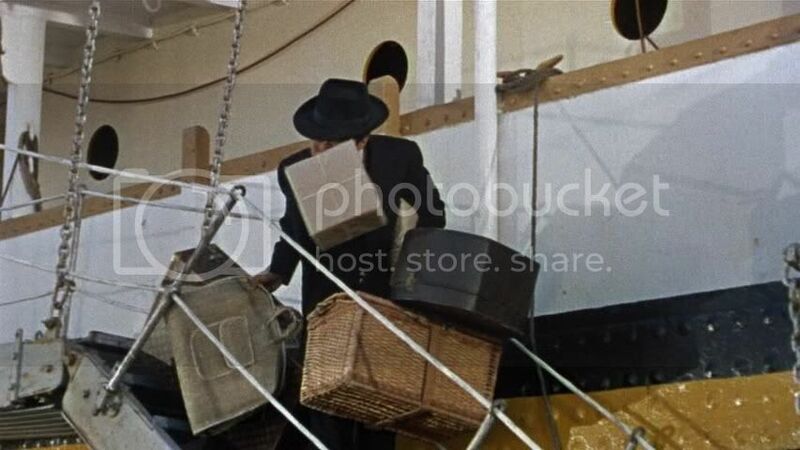 I'll just throw out The Seven Little Foys (1955). Not The Seven Little Foys. 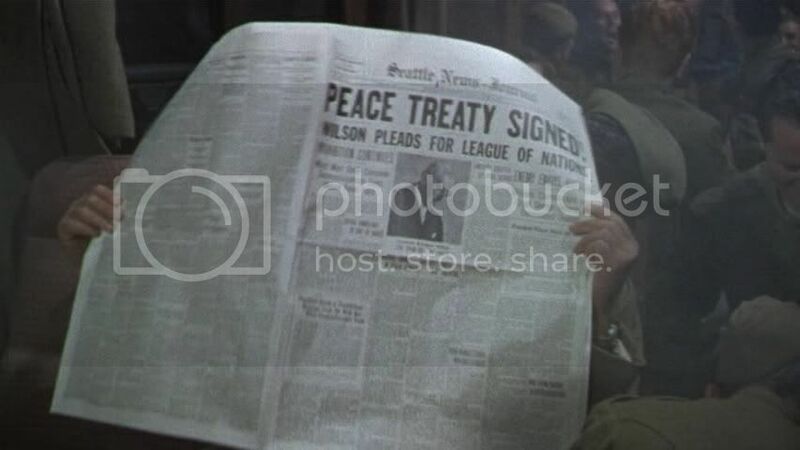 ^The actor holding the newspaper played a recurring character in a series of TV commercials, which was later the title character of a theatrical film released in the 1990s. ^The movie's three top-billed stars can be seen in this shot. ^Important to the plot; if you know what it is, it should help with determining the correct title. The movie is based on a novel. The author's previous novel had also been adapted as a film for the same studio and was a big box office success. This movie was not. 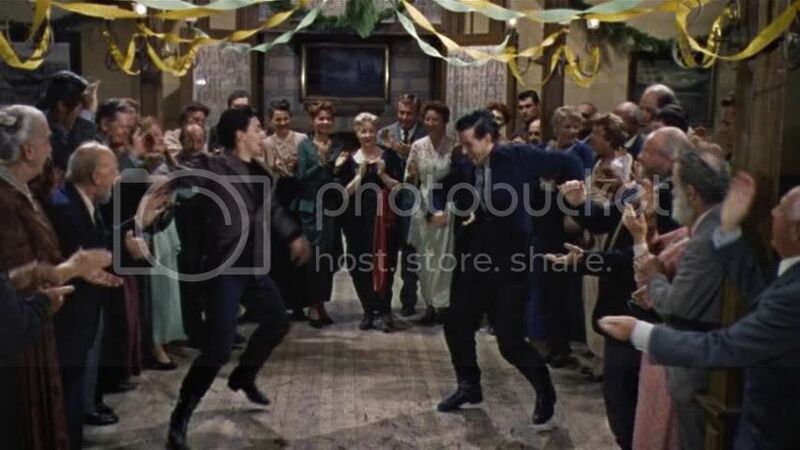 ^This actor had a regular role on a TV series, premiering in the 1950s, that shared its distinctive physical setting with this movie. Both the series and the movie were likely produced (at least in part) to capitalize on publicity associated with a world event of the time. Last edited by obscurelabel; 01-19-11 at 06:34 AM. The actors from shots 3 and 5 are of Asian ancestry, which one might probably guess about one of them, but probably not about the other. Last edited by obscurelabel; 01-19-11 at 10:33 AM. Is it Ice Palace (1960)? The Addams Family, Gilligan's Island, and Star Trek were all adapted as at least one later animated series, at least one later live-action spin-off series (there was a Gilligan's Island reality show, I think), at least two feature length films, and as an arcade pinball machine. 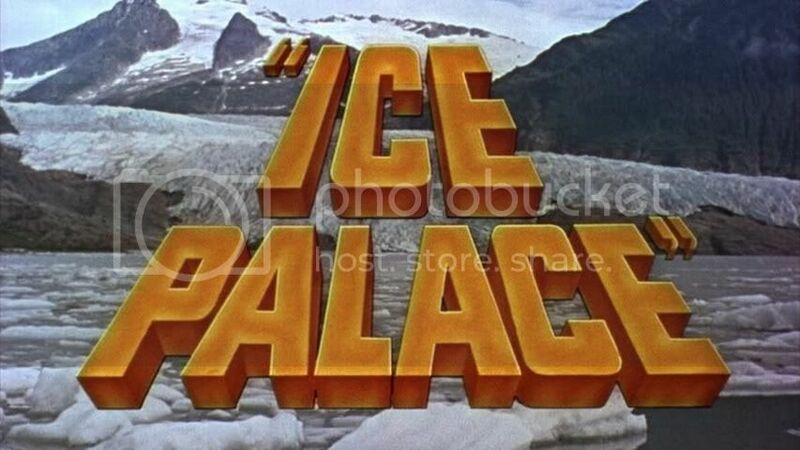 Carolyn Jones, Jim Backus, and George Takei are all in Ice Palace. The guy in shot #8 could be Ray Danton who was in the 1950s TV show The Alaskans, which, like Ice Palace, was set in Alaska. Ice Palace is based on a novel by Edna Ferber who also wrote Giant. 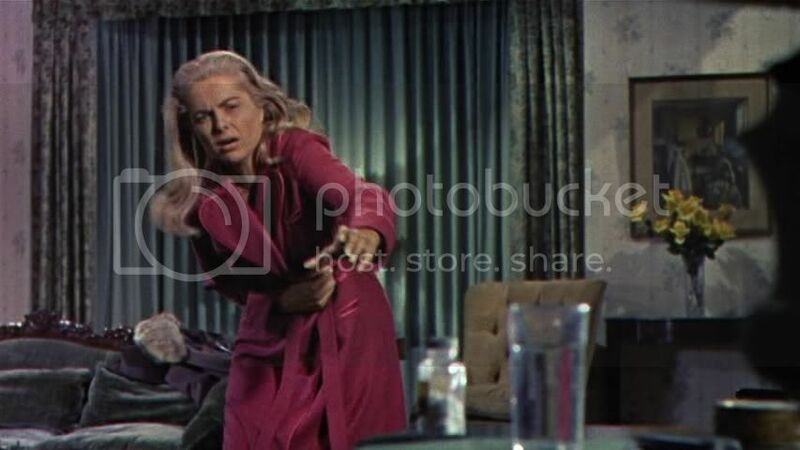 I guess that's Martha Hyer in the 2nd and 4th pics, and Jim Backus in the 5th (Mr. Magoo advertised beer in the '50s, and Leslie Nielsen played Magoo in the '90s movie). Last edited by Dimension X; 01-19-11 at 01:56 PM. ^Ah, I was looking at Hyer's resume last night, but must've passed over that movie because she wasn't the "fourth-billed actor". I took all the shots last week when the South was frozen in. This dour, tired, cheap-looking Giant knock-off was always spoken of favorably by my mom, who saw it when it first came out. When I was a youngster, it never seemed to show up on TV, and over the years I came to imagine it featuring an actual manifestation of its title, a combination of the Fortress of Solitude and the country estate in Dr. Zhivago. Entering the DVD age, I had still not seen it, and promised my mom I would get it if it ever was released (it was out on VHS but I never bought many of those). When we watched the Warner Archive release, it was a disappointment to be sure, although I think she still liked it somewhat. 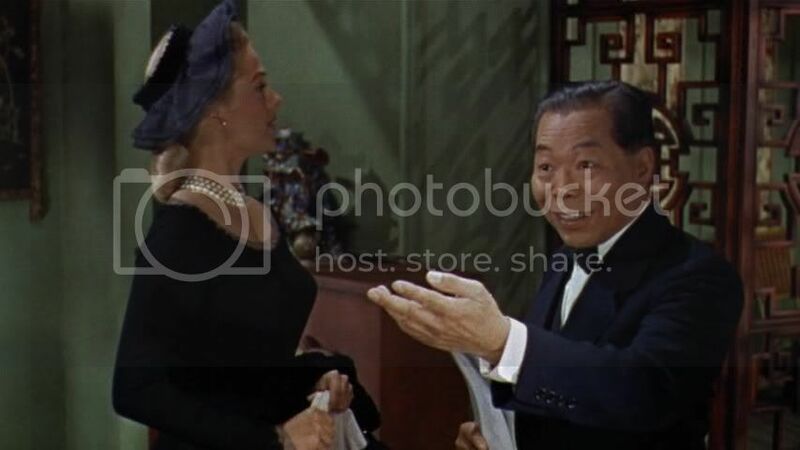 Yes, that's Martha Hyer (Sabrina, The Chase) in shot 2 (with Walter Yip) and in old-age makeup in shot 4. Hyer is fourth-billed onscreen and on the poster art; I think that IMDB has it wrong. The credit order at the beginning of the film is Burton, Ryan, Jones, and Hyer. George Takei is comical Chinese flunky Wang ... yes, Wang ... in shot 3. This was his film debut. Shot 5 is Backus (who was of Lebanese ancestry according to the interwebs). I was remembering his long running series of Mr. Magoo commercials for GE light bulbs. Burton, Jones, and Ryan are obscured in the crowd in shot 6. 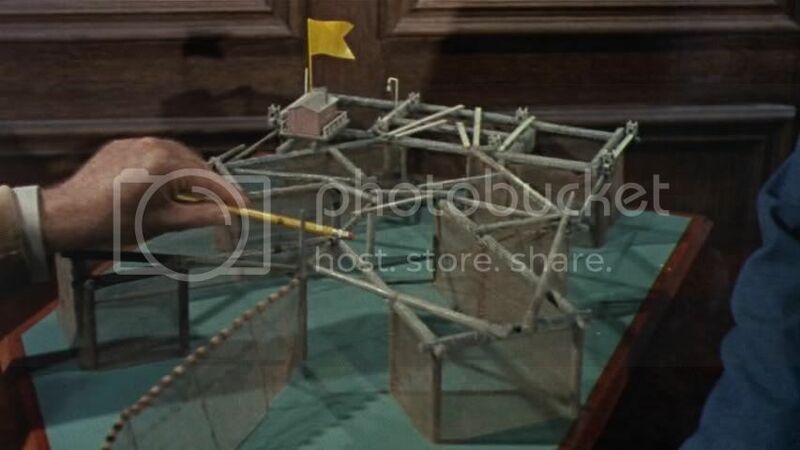 Shot 7 is a model of a large-scale salmon trap. 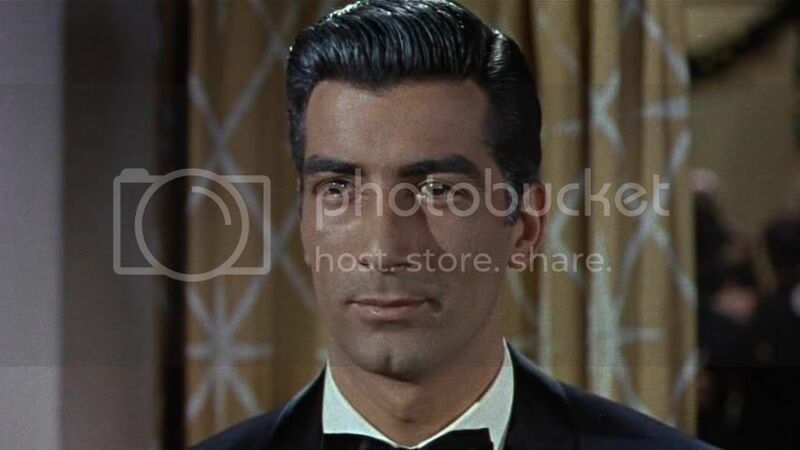 Shot 8 is The Alaskans regular Ray Danton (The Rise and Fall of Legs Diamond); producers of the series and Ice Palace alike were likely hoping to benefit from the then-current buzz about Alaskan statehood. Shot 9 is the lovely and mysterious Dorcas Brower (edit - more Googling reveals she was a 20-year-old Miss Alaska and Alaska Airlines stewardess -- this was her only film or TV role). Shot 10 is, well, salmon canning. Everything else is correct per Dimension X. Last edited by obscurelabel; 01-19-11 at 04:23 PM. I figured the "distinctive physical setting" had to be Alaska or Hawaii. Shot #9 settled that. Don't remember those. The beer commercials were the first thing that popped up on YouTube. I'll post something later this evening. Last edited by Dimension X; 01-19-11 at 02:48 PM. Hyer is fourth-billed onscreen and on the poster art; I think that IMDB has it wrong. 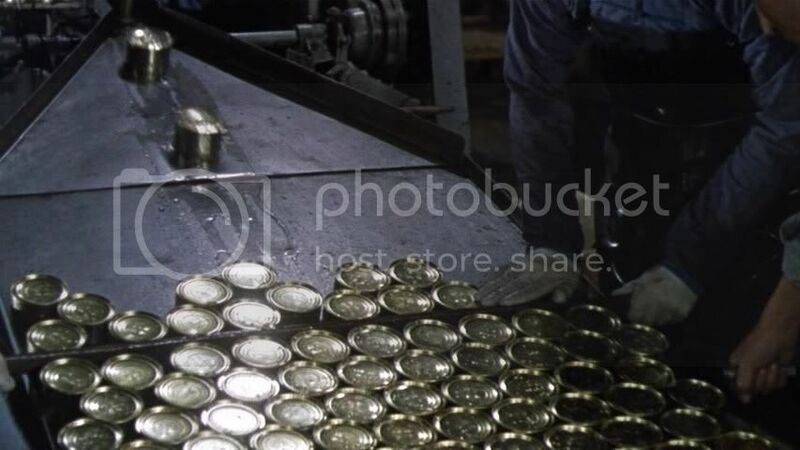 The credit order at the beginning of the firm is Burton, Ryan, Jones, and Hyer.